I always appreciate a company that has made safe, healthy and organic products for many years...even before the high demand for healthier, organic foods came about! Dave's Gourmet is one of those awesome companies that for over 20 years has made clean, organic, and Non-GMO specialty foods that are good for your body and the earth. And recently, they added their newest pasta sauce creation, Creamy Parmesan Romano. This gluten-free super sauce showcases mouth-watering aged Romano and Parmesan cheeses, juicy ripe California tomatoes, premium California garlic, extra virgin olive oil and fresh herbs to create a rich and creamy sauce that is bursting with flavor. It tastes amazing with ravioli, tortellini or even spaghetti noodles! Perfect for the consumer that likes to take the simple and effective route to at-home gourmet cooking, Creamy Parmesan Romano sauce can be used in variety of ways: Served over pasta and simmered with brown meatballs, utilized as a pizza sauce, pan cooked with chicken or vegetables or baked with salmon. It’s a sauce that was created for the innovative chef! They also offer several other organic pasta sauce options that our family is really loving including Spicy Heirloom, Marinara and Red Heirloom! They make for an easy, but delicious and organic meal for my whole family! 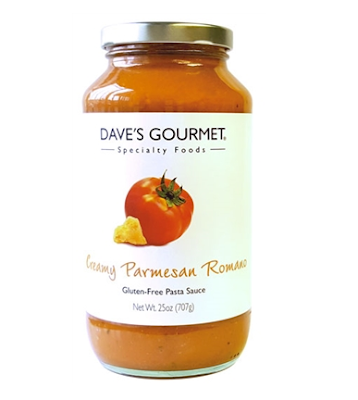 You can purchase Dave's Gourmet pasta sauces from their online store. These sauces look delicious. I'd love to try the Hearty Marinara Sauce. These sound nice. I like that they are USA made. I would try them if they didn't have dairy in them though..